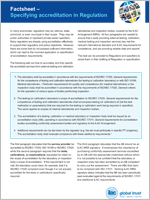 The ILAC Mutual Recognition Arrangement (MRA) is an important and effective tool for government and regulators around the world to be aware of and use in the acceptance of data and results from accredited laboratories and inspection bodies that have carried out calibration, testing, medical testing and inspection work. This work may relate to the provision of local or national services, such as providing safe food and clean drinking water, providing energy, delivering health and social care or maintaining an unpolluted environment. Equally governments and regulators can take advantage of the ILAC MRA to further enhance or develop trade negotiations and agreements with other economies. By removing the need for products to undergo additional testing or inspection in each country into which they are provided, the ILAC MRA promotes the acceptance of products across national borders. In this way, the free-trade goal of “accredited once, accepted everywhere” can be realised. The ILAC MRA provides a credible and technically robust framework on which to further develop and enhance government to government bilateral and multilateral international trade agreements. The ILAC MRA acts as an internationally recognised ‘stamp of approval’ to demonstrate compliance against agreed standards and requirements. Risk is therefore minimised, as decisions will be based on reliable test results. Duplication is minimised as test and calibration data included in submissions for product approvals can be evaluated without re-testing. 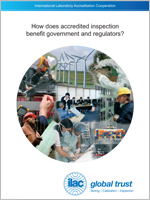 Many government agencies have recognised the importance of credible accreditation programs that are developed against internationally recognised standards. 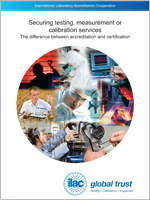 Accreditation and the ILAC MRA helps regulators meet their own legislated responsibilities by providing a globally recognised system to accept accredited test reports. 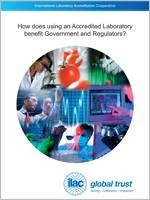 The ILAC MRA Annual Report provides information on the activities carried out as part of the peer evaluation process each year to ensure that regulators and consumers of laboratory and inspection data are able to maintain confidence in the results produced under the ILAC MRA. The latest statistics and graphs on the number of accreditation bodies and accredited conformity assessment bodies globally are available from the Facts & Figures page. Find out how regulators and policymakers are using accredited conformity assessment and the ILAC MRA to achieve their policy objectives through case studies and research on standardisation, accreditation and conformity assessment.